Flats 1/2" to 12" thick in widths up to 24"
These properties are obtained through its chemistry as well as its unique manufacturing processes of ladle refinement, vacuum degassing and forging methods. 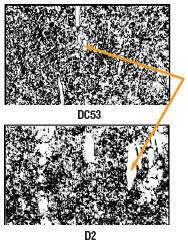 DC53 also has excellent machining characteristics and is well suited as a sub-straight for PVD surface treatments. DC53 can also be hot process CVD and TD (Thermal Diffusion) coated however post heat treat is generally recommended. Primary carbides in DC53 are relatively small with highly uniform distribution as compared to other tool steel grades such as D2. This helps to provide DC53 with it’s superior toughness, and fatigue resistances. Daido Steel Limited and International Mold Steel, Inc. shall not be responsible for damages caused by misunderstanding or improper use of the technical information contained in the brochure. The contents of this brochure may be subject to change without notice. Please inquire for the latest information. No portion of this brochure may be reproduced without express permission of Daido Steel Limited and International Mold Steel, Inc. DC53 in a registered trademark of Daido Steel Limited and International Mold Steel, Inc.